In celebration of the pending U.S. presidential election, I’m going to “show reruns” of my two most patriotic posts. I originally posted “Presidents Halverson” during the presidential primaries back in February. My recent post about my Big Thinker, my future U.S. President, got me to Thinking Big myself: What if ALL THREE of my boys became President? Wouldn’t that be a kick? It’s not as crazy as it sounds. Consider the Kennedys. And the Roosevelts. And the Adams and the Bushes. Even the Clintons, perhaps? Clearly, despite the democratic process, the U.S. Presidency tends to run in families . . . and the Halverson Triplets do have some feisty, opinionated genes. Why couldn’t they be the three most powerful men in the world? Apparently I’m not the only one harboring grandiose thoughts. This morning my Big Thinker confirmed my suspicion that he won’t ever be “stuck in the middle” when he responded to my explanation about why we’d be detouring our morning walk to our neighborhood polling center. My middle son looked at the list a moment, with a nugget of granola stuck to his chin. Then he pointed his oversized serving spoon at me. “Pick me, Mommy,” he said. His brothers grinned widely. They loved the idea. And the order. As far as they were concerned, it was a done deal. Presidents Halverson, at your service. An hour later, when I huffed and puffed into the polling station with our side-by-side triple jogger, the boys promptly climbed out and announced their candidacy to volunteers. Rounds of congratulations ensued and “I VOTED” stickers landed on every lapel. It was now official. Putting my shoulder to the stroller once again, I left the station with extra spring in my step. 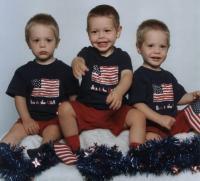 I, Deborah Halverson, was the proud mother of the only triplet brother Presidents in the history of any country, ever.